This book connects the chemistry and biochemistry of sulfur in order to understand these impacts and to inspire the rational discovery of further beneficial applications. Compounds and materials containing sulfur have an important impact on medicine and health, foods, new materials as well as our atmosphere. After a review of the chemical principles which provide the foundation for sulfur’s unique contributions to the properties of its compounds, these principles will be used to interpret the application of these compounds. This book will not only provide a fundamental understanding of the properties of sulfur compounds but more importantly, inform about the rational development of new applications. This monograph will inspire new technologies that exploit sulfur’s unique properties, availability and low cost. Sulfur in the Modern World will be useful to researchers synthetic, organic, bioorganic, bioinorganic chemists, and materials scientists. Postgraduates and undergraduate students of chemistry, biochemistry, geochemistry, and the atmospheric sciences will also find this monograph beneficial. Sulfur and its compounds play key roles in biochemistry, foods, medicine and health, polymers, nanomaterials and the atmosphere. Central to these roles is the chemistry of sulfur. This book endeavors to provide insight into the chemistry that underlies the gainful exploitation of sulfur by Nature and by man. 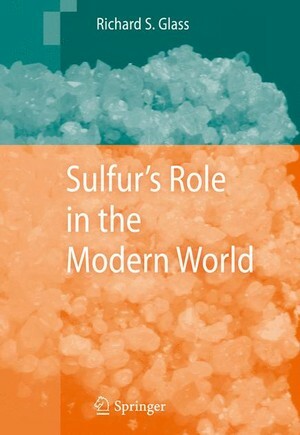 Sulfur's Role in the Modern World reviews the chemical principles germane to sulfur's properties. An overview of the use of sulfur in organic synthesis is followed by consideration of metal-sulfur compounds. This provides the basis for a discussion on the role of sulfur in biochemistry, origin of life, medicine and health as well as toxicology. Furthermore, the book provides information on sulfur compounds in food as well as on sulfur's role in nanotechnology and materials science. The treatise concludes with sulfur cycles and their impact on the atmosphere. This opus is aimed at specialists and non-specialists alike. It is impossible in a work of this size to comprehensively review such a large body of information. Consequently, the author has subjectively selected those aspects and topics that in his view have the greatest impact with the hope that this presentation will fire up creative new ideas which will further exploit the cheap, abundant and multifaceted element - sulfur. Review of Chemical Principles Relevant to Sulfur’s Properties.- Use of Sulfur in Organic Synthesis.- Metal-Sulfur Compounds.- Occurrence and Role of Sulfur in Biochemistry: Sulfur, the Life of the Party.- Sulfur and the Origin of Life.- Sulfur Compounds in Medicine and Health.- Toxicology and Sulfur.- Sulfur Compounds in Food: The Taste and Smell of Sulfur.- Sulfur in Nanotechnology and Materials Science: From Pigments to Quantum Dots.- Sulfur Cycles – Atmospheric Impact.